One of my longtime fears of working out is that I will work out so hard I will have a heart attack. That feeling of my heart going “Boom! Boom! Boom!” in my chest after exerting myself for a few minutes historically had me freaking out enough to sit down, drink a big glass of cold water and resume couch potato position. 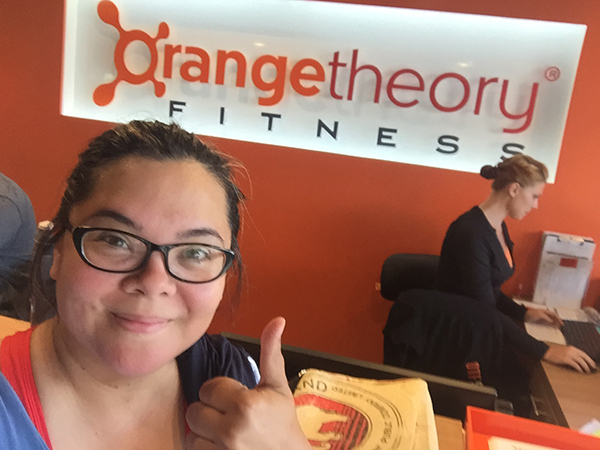 So it was serendipity when I was on Facebook several months ago and spotted the ad for the new La Mesa Orangetheory Fitness. My interest was initially piqued by the bright, happy color surrounding the smiling fit people in the photo. But then I saw that it was interval training and I began to have images of me clutching my chest in pain as I fall off a running treadmill. Still, I knew I had to do something. I really wasn’t sweating enough with the minimal exercise I was doing. So I called to sign up for a trial session. Studio manager Erin patiently listened as I laid out my worries of having a heart attack. She chuckled a little before assuring me I would probably not have a heart attack and in the unlikely event my heart did accelerate to an unhealthy rate, they would see that on the screen. See my heart rate on the screen? Say what? The theory behind this method is if you can get 12 minutes or more in the orange zone, you will continue to burn calories 24 to 36 hours after your workout. Additionally, every minute spent in orange or red earns you “splat points,” which egg you on the next session to get more to beat your score. And that’s where it’s really at: competition. I also recently signed up for the weight loss challenge, which kicks off on Sept. 11. You can compete with other members to see who can lose the most percentage of weight for a cash prize. It’s exciting and it gives you motivation to attend more classes. So far, I’ve really enjoyed my Orangetheory membership. And while I really like trying to accumulate splat points, I especially appreciate the fact I can continually monitor my heart rate to keep myself off the couch. —Genevieve A. Suzuki is a La Mesa resident who practices family law. Visit her website at sdlawyersuzuki.com.